Everybody knows that more visitors to a website means more signups, purchases or enquiries. But how do you increase traffic in an already crowded online space? After all, there are only 10 spots on the first page of Google. The answer is SEO – or search engine optimisation. In this case study I want to outline the process our SEO team have been using with a client website for the last 10 months, which has resulted in a 277% increase in traffic. Working closely with our client we took average monthly visits from barely 1800 to over 5000 in just 10 months. Our client is in the competitive insurance sector located in a major UK city. Their goal was to increase local, regional and national brand awareness, secure more job listings and raise candidate applications. As we had rebuilt it a year earlier, we were in complete control of the company website, making it easy to attribute any gains and implement technical suggestions in-house. And our client already had business pages on Facebook, LinkedIn and Google. The UK recruitment industry is dominated by a few nationwide companies and around 50 regional agencies. Most have been around for years and investing in SEO for almost as long. Breaking their hold on the web was never going to be easy – or quick. Google frequently adjust the rules and regulations (commonly known as algorithms) they use to rank websites. So it’s fair to say they’re open to change. However, in a sector like recruitment, where the major players have been around for 10, 15 or even 20 years, Google has had ample time to choose who goes on the first page of searches – and validate those decisions. The challenge of forcing a relative newcomer into such a well established pack will always be difficult. We began by looking at all the sites occupying the first two pages of a Google search. We analysed their keywords, offsite signals (backlinks, reviews and citations) and any technical vulnerabilities we could use to our advantage. There are plenty of ways of discovering what makes your competition successful. Probably the easiest way to discover who your competition are is by searching on Google for the services you provide, followed by the name of your town or city. For example; “Recruitment agency in Birmingham”. SEO – especially on a local level – is about conforming to certain metrics, established by Google in an attempt to deliver consistent and reliable search results. Invariably the sites that rank best satisfy the highest number of these metrics. So it follows that by measuring and then ‘outscoring’ the competition in each category a site will eventually rank above them. The data confirmed our suspicions – the best performing sites were more than ten years old, had thousands of pages of content and in many cases tens of thousands of backlinks. There was very little opportunity to beat them using traditional SEO methodology. On a more positive note, we found companies listed in the arguably more valuable Google Maps box (and in results served up on smartphones) were ranked using more contemporary metrics, with much less focus on keywords and heritage. 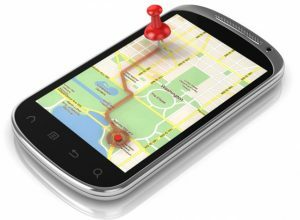 Instead, other more relevant factors – like reviews, physical location and social signals are used to provide a more geographically appropriate answer. And the best performing sites in this section are often smaller, locally based agencies, rather than national or multinational corporations – with a franchise in the city. This was a far more balanced playing field and one we saw real opportunity in. We built our client’s site, so we knew it was technically sound, but to identify the opportunities available we conducted a full onsite audit. This flagged up several areas where we could ‘optimise’ existing content, especially with meta-information – small snippets of coded data only visible to search engines. This was important, because the site contained more than 50 pages, an active blog and thousands of job posts. Making existing content work better is a cost-effective way to use what’s already there – and create a solid base to develop future strategy. We used Google’s keyword planning tool to find keywords, and more importantly the longer search phrases people actually type into Google, when they’re looking for a job. Terms such as ‘’recruitment agency’’ are traditionally considered the most valuable and tend to be very competitive, because every employment agency wants to rank well for them. But these are usually dominated by a handful of the largest companies. 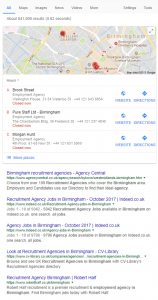 We began adding our clients home city to the same search terms – changing ‘’recruitment agency’’ to ‘’recruitment agency in Birmingham’’ for example. This reduced the level of competition – increasing our chance of a better ranking.  Taking this process one step further and making the search even more specific, by adding a specialisation to the term – let’s say ‘’healthcare recruitment agency in Birmingham’’ – makes it even more likely we can achieve a positive outcome. While these keyword phrases got a lower number of searches, they do attract very reasonable search volumes and are much, much easier to rank for as there are less sites competing for them. Armed with our list, we returned to the company website and optimised main pages for keyword phrases. This involved placing the terms within the text in a natural way, using them in the title and meta description of the page (reproduced by search engines in results). Google cannot read photos, so we also renamed images with keyword-rich titles and descriptions further optimising the site. All successful websites run a blog and publish new posts regularly. Google loves to see new content and as part of our SEO plan the client committed to publishing 2-3 posts every month, using keywords provided by us. Using the Yoast plug gives complete control over the information displayed about your website in search engine results. We used a free tool called Yoast to optimise pages. It’s easy to work with and uses a simple scoring system to indicate what changes need to be made, providing clear instructions on what to do. At this point our client’s website had no first page rankings, nor did it appear in the Google Maps section for searches using the name of their home city. Using the information we’d gathered from competing websites we looked for easy wins – ways to match or exceed the competition quickly and easily. Our work in Step 1 – analysing the best performing sites in the sector – had provided us with the locations of our competition’s backlinks, citations and reviews. So to begin we copied as many of these as possible. For backlinks that meant visiting every website on our list to create a link of our own – by either requesting it directly from the owner, submitting a guest post or adding comments to an existing article. Citations are similar to backlinks and typically come from business listing sites like Yelp. There are thousands of these sites – some are very localised while others are global. Google decides which of these are most relevant to any given geographical area. So using the same citation sources as our competition ensured they were relevant and that we weren’t wasting our time. Google loves reviews – and they’re much easier to get than you may think. The most effective review sources are Google and Facebook, followed by LinkedIn and business listing directories. We suggested our client began politely asking customers to leave a review. If you’re looking for high value citation sources a good place to start is a site called Whitespark. It has an excellent tool that identifies the best business listing websites by city and industry. Every website needs an online evangelist – someone who acts like their biggest fan and brand ambassador combined. To be effective this requires around 3-5 hours of work per week, every week, for 4-6 months and involves a variety of on and off page activity. We were working with an excellent client. A company in a competitive sector where strong web presence is important. So they were well motivated to accept our suggestions to publish regular blog posts, engage with social media and generate the odd customer review. 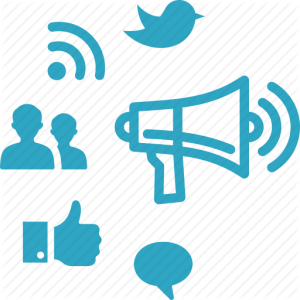 Expanding social media presence (by joining groups in the recruitment sector and actively ‘participating in’ topical conversations). Creating company accounts on trade forums and blogging communities around the world – where we could re-publish content to new audiences and build high quality backlinks. Submitting posts to key influencers in the recruitment sector, requesting their opinions and building more high quality backlinks. Actively seeking out websites, forums, blogs and Q&A directories where we could answer people’s questions, with a short comment referencing pages and posts on our client’s website. If you stop and look at the most successful online brands you’ll see they’re everywhere – publishing new content, engaging with social media, maintaining a high profile on forums and answering people’s questions. These companies provide Google with exactly what it wants to see. Plenty of signals from around the web, all pointing back to one place. In return they’re rewarded with higher search engine rankings and more traffic. We’ve been doing the same and over the months some of our work has taken on a life of its own. Blogs published on third party websites, comments on social media and subjects raised on trade forums or blogs became conversations in their own right, attracting others to contribute. Working closely with our client, we’re beginning to raise their profile to the status of authority figure. People on trade forums, LinkedIn groups and Q&A sites ask them questions, or reference articles published on their website. Within 5 or 6 weeks of beginning this strategy began to realise an increase in visitor numbers – something that has continued month on month ever since. Our client’s website now appears in first, second or third spot in the highly prized Google Maps feature – above regular results – for a broad spread of ‘Recruitment’ related searches in their city. What’s making our local SEO strategy successful? Because SEO includes a wide variety of subjects it can be very hard to understand what works and what doesn’t. We based our activity on what we could see was already working for the most successful companies in the sector. Once we’d replicated as many of those successful strategies as possible, we could look at ways to improve on it. Rather than rushing to do everything at once, we’ve taken a controlled and steady approach, with an emphasis on consistency, rather than volume. A steady drip, drip, drip of signals is far more effective than occasional blasts. Google crawls websites frequently, noting every change from earlier visits. Our evidence shows that having something new to show them on each visit is an effective way of making an impression. Before last year our client had done very little by way of SEO. But our experience – working with other companies in similarly competitive sectors – means we have a good idea of what gets results. The technical standard of a website – We always begin with a deep SEO audit of the site and fix any tech issues. Fresh content – Blog posts and news articles, published 2-3 times a month and optimised for keywords. Backlinks – We try to add a varied selection of between 20 and 50 backlinks every month. Citations – Again we look for a mix of citation sources, combining well known online business directories, with smaller, local listing sites and city guides. Reviews – Nothing impresses Google more than positive reviews from satisfied clients. The best place for these is a Google Business page. But keep it varied, try to get reviews on your Facebook, LinkedIn and directory listings too. The company we’ve used for this study are great to work with. They’re publishing blog posts, news articles and whitepapers regularly and backing it all up with plenty of social media activity. That gives us the freedom to identify fresh opportunities, expand our goals, experiment and occasionally fail, with their full support. Want to increase the number of people finding your business online? Our SEO team can advise you on what will work for your company, develop a plan for your team to follow or manage the entire optimisation process on your behalf. To provide an accurate snapshot of how your business is doing right now and plenty of ideas to improve your website’s SEO, claim your free website audit report here. Created specifically for your company, we’ll highlight what you’re doing right, how you compare to the competition and what action you need to take to improve things. By analysing more than 100 individual factors we’ll provide you with an accurate breakdown of easy fixes and achievable goals. All presented in a handy, easy to read pdf that you can share with your team. Order your free local SEO report now. Alternatively, for more information about how our SEO team can help your business attract new customers, give us a call and ask for Rachel, Richard or Matt +34 928 359 902.